In this edition of the LRCCS Spotlight Series, I sat down with LRCCS Faculty Professor Martin Powers, the Sally Michelson Davidson Professor of Chinese Arts and Cultures. 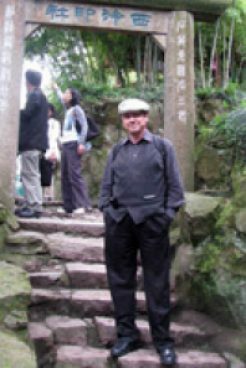 In this interview, he talks about how a discourse of social justice has persisted in China since Han times, and more of the fascinating new ideas to be presented in his upcoming book. Couillard: So let’s take it all the way back – where do you call home? Prof Powers: I grew up in a working class neighborhood in Chicago. I was lucky to be sent to a Catholic school where the academic standards were higher. My parents hadn’t gone to college but I had a teacher in high school who really pushed me in that direction, so I ended up at Shimer College, where I majored in art history. Prof Powers: When I declared my major at the University of Chicago, they wanted me to choose between European or Chinese art, and I chose China. This was the 60s so there was kind of an “Asia craze” at that time. You could go into any book store and find books on Zen, Haiku, etc. Couillard: So what’s the area of art history you specialize in? Prof Powers: Well that’s changed over time. I have a couple books on the Warring States to Han periods and they focus on bureaucracy, and more recently I’ve published quite a bit on the early modern period, especially the Song. I’ve always blended art and politics, social issues, things like that. My first book deals with student demonstrations – probably the first in the history of the world. Couillard: When did those happen? Prof Powers: The Han period. The students came from the Capital University in Luoyang. I found the situation at that time strangely similar to my own upbringing. Before Kennedy, for the most part only the children of upper class families could attend college. But then Kennedy comes around with student loans in the 60s and so college becomes much more accessible. Once higher education includes more than the most privileged, student demonstrations start to happen. This parallels what happened in the Han Dynasty. Up until about the year 130, higher education was limited mostly to the the sons of higher officials,, but after Emporer Shundi, the sons of lower and middle official families had access to higher education. So in 157 CE, there was a lot of corruption coming from the eunuchs, and the less well-off students led a major protest against it. That’s what my first book was about, Art and Political Expression in Early China. Couillard: Where does art fit in? Prof Powers: There was a lot of political art at the time. Many of the people involved in the resistance were killed by the eunuchs, so people made commemorative paintings and hung them up in the postal stations as portraits of martyrs, hoping to stir up the population. Couillard: Wow. That sounds very similar to the “Say their names” movement going on today (http://saytheirnames.org/). I guess history repeats itself. Prof Powers: The manuscript I just finished deals with England and China. England learned a lot about political theory and practice in China from the 1660s through the early 19th century. Some of the social justice issues discussed in the Chinese documents were similar to those that concerned English radicals – such as free speech or rule of law. Couillard: How was England learning about China at that time? Prof Powers: The Jesuits provided a lot of information – the customs, the political system, and even translations of exemplary laws and policy documents. At that time, any Chinese taxpayer, including women, had the right to bring suits to court. Anyone could appeal a case. You could even sue the magistrate. If a magistrate was accused of a crime, the county was not permitted to investigate the matter – they had a separate department that checked on official corruption. So the English started learning about this stuff. Voltaire was reading about it. Sam Johnson wrote a book review about the content of a major tome on the subject by J.B. Du Halde (1738). Much of this new information came into the enlightenment discourse by the 1750s and 1760s. Prof Powers: Yeah. I think there’s stuff in the history of that time that should go out to a broader audience. People need to know that China had a bigger role in the discourse of human rights as it was developing in the 18th century. It’s not about saying “China did it first” – I have little patience with nationalism. There’s much more at stake. There’s a trend among bloggers in recent years to the effect that human rights and democracy is just a fluke of Western Civiliazation, and that through most of history, a few rich people at the top have always ruled over the masses. They think democracy’s time is over and now we’re just going back to normal, which is to say, feudalism. That argument is unfortunate. Because if you broaden your gaze to include China (and probably other places as well), then you find many more cogent arguments for individual rights than the people posing those arguments are aware of. So maybe an egalitarian legal system is not just a fluke – if some of the same arguments for free speech, or equality before the law, appear in both China and in Europe, maybe these concerns are inherent in the human condition. Couillard: That’s so cool! So what are you hoping will be the impact of changing that discourse? Prof Powers: Number one, I want to undermine that narrative. But more concretely, from the China side, if they could take ownership of this idea, their leadership might take the notion of human rights more seriously. I’m also hoping that knowledge of China’s history of social justice writing can help to build bridges. So instead of the US flogging China for failing to embrace “Western values”, we can focus on our common ground.